The Supreme Court on Wednesday rejected the request of Hadiya’s father Asokan KM to adjourn the hearing in the matter scheduled for Thursday. Asokan KM had requested Chief Justice Dipak Misra to adjourn the hearing as he needed more time to file a reply to the affidavit placed before the court by his daughter wherein she has stated that she embraced Islam and married Shafin Jahan out of her own free will. The CJI, however, turned down his plea saying the matter will be heard tomorrow as scheduled. It is to be noted that Hadiya had filed an affidavit before the apex court on Tuesday categorically stating that, “I embraced the faith/religion of Islam on my choice as per my conscience and on my own free will after studying about Islam and thereafter I married a person, namely Shafin Jahan, the Petitioner herein, from the same faith as per my choice and on my own free will”. She has stated in the affidavit that his father was under the influence of certain sections of society who were trying to use him. Meanwhile, Asokan KM also had filed an additional affidavit before the court on Tuesday replying to the counter affidavits filed by the Markazul Hadiya of Sathyasarani Educational and Charitable Trust where Hadiya took lessons in Islam and AS Sainaba, the president of Popular Front of India (PFI) women’s wing, who was once Hadiya’s guardian after the girl allegedly left her home to study Islam and later, when she refused in the Kerala High Court to go with her parents. It is to be noted that both Markazul and Sainaba have been interrogated by the NIA for their alleged role in over ten cases of conversions in past few months. 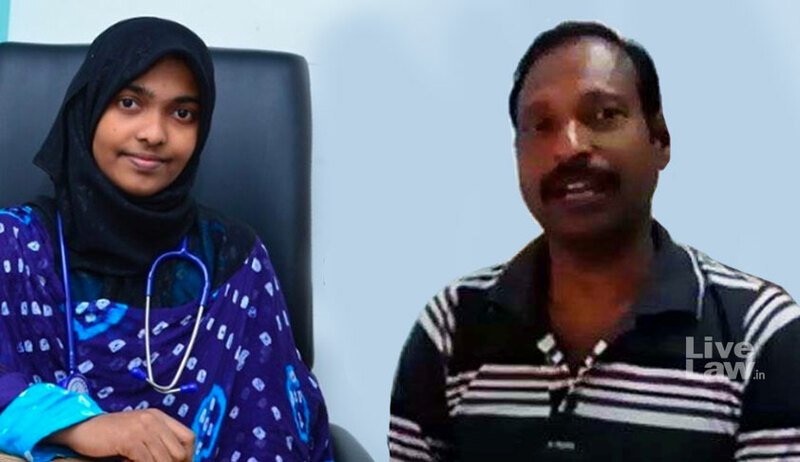 Hadiya’s father said the activities of Markazul and Sainaba were aimed at shredding the secular and multicultural fabric of our country which have been further exposed by sting by various national news television channels that stand uncontroverted. Hadiya’s father also denied the allegation made by Sainaba and Markazul that “I have attempted to tarnish the religion of Islam is absolutely ludicrous. It is absurd for Respondent No. 7 (Markazul) and 8 (Sainaba) to suggest that a poverty-stricken ex-armyman abandoned by his only daughter can tarnish the mighty religion being practiced all across the world”. He said the affidavits of the two parties to show their charitable activities are only a belated attempt in the light of NIA shedding light on their activities. “By filing their respective counter-affidavits, the respondent Nos. 7 and 8 have made a failed attempt to show that they are only engaging in “religious and charitable” activities which is simply a charade to conceal the nefarious and illegal activities of indoctrination, brainwashing and radicalization being done by them through an organized and systematic apparatus,” he said. “The respondent Nos. 7 and 8 are nothing but a front for PFI/SDPI and/or agents thereof, just as the petitioner is. Each one has played a role in engineering the deep and diabolical brainwashing of my daughter with an intent to traffic her out of the country to ISIS territory. My daughter is not the only victim. There are several others, some of whom such as Nimisha (aka Fathima), Merin (aka Mirriam), Aparna (aka Shahana), Bexin (aka Issa), Bestin (aka Yahiya), Sonia (aka Ayisha) who have already been trafficked out after being fed with extremist propaganda,” he added. Asokan likened the activities and modus operandi of the Sainaba and Markazul to Boko Haram of Nigeria. “Recently, similar methods have also been used by Boko Haram in Nigeria in which the captors kidnapped girls from schools and impregnated them. Now, they have declined to meet their parents from whom they were kidnapped. Such is the power of indoctrination and psychological brainwashing by extremist elements. Respondent Nos. 7 and 8 have been steeped in a diabolical plan to identify and trap vulnerable youth, lure them into conversion and finally lead them out to ISIS territory to further the latter’s agenda … Recently, a victim narrated her ordeal to a news channel wherein she stated that she was forcefully converted to Islam at Respondent No. 7 (Sathya Sarani) Institution where she was also threatened to not disclose anything that she went through or else they would harm her children,” he adds. Asokan said in his affidavit that Sainaba has never denied that she is the national president of the National Women Front, the women’s wing of PFI and Sathyasarani is the organization constituted and being run by the PFI. “The exceedingly unusual interest shown by the 7th and 8th Respondents itself shows that the PFI and SDPI are behind the illegal conversion of Akhila in to Islam, attempt to transport her to Syria, the conducting of fake marriage etc,” he said, adding, “The PFI had collected more than eighty lakhs rupees for conducting the case before this Hon’ble Supreme Court”. “The reason for Respondent Nos. 7 and 8 to take exceedingly unusual interest in conducting the case before High Court and before this Hon’ble Court is that in case this Hon’ble Court finds that the conversion of Akhila is shrouded in mystery, the marriage is fake etc. the same would be a great blow to Respondent No. 7 and 8 which would work as a clear impediment to illegal conversions and other unscrupulous and notorious activities that the said Respondents are doing regularly and on a considerable scale,” his additional affidavit stated.